An often overlooked staple for any summer wardrobe is a collection of relaxed tees. The free-flowing fit of a relaxed shirt makes for a breathable silhouette, and those of the cotton variety, in particular, are essential during warm-weather months. There's a certain cool factor to this type of tee too—it brings a casual ease to any outfit and never appears too neat or overthought. That's all without mention of versatility. Relaxed tees can be worn tucked in, loose, or partially tucked at the front of the hemline; with jeans, shorts, skirts—the possibilities are endless. Styled right, a loose shirt can be worn anywhere from the office to the beach. And these perks don't have to cost you. Quality relaxed tee can be found at a variety of very reasonable price points, so stock up—this is one item you'll want to have on hand throughout the season. Keep reading for 20 relaxed tees that will become instant favorites in your wardrobe—and they're all under $50. A slouchy V-neck in a neutral hue is a must-have. Dress it up for work or save this chic tee for the weekend. The three-quarter bell sleeve really makes the silhouette. This tee drapes with an elegance that's so effortless. Keep cool in this slouchy cotton pick. A cutout at the back adds interest to this otherwise simple tee. The dreamy blush color complements this shirt's ruffled edges. A lightweight tee with a loose silhouette makes for a must-have basic this season. We didn't know we needed a top in a soft rust color until now. This slub tee features burnout detailing for a casual look. Lace detailing adds structure to this oversize shirt. The dropped shoulders and waffle knit add a little extra detailing to this otherwise simple black tee. The tie-sleeve detailing makes this a breezy summer pick. 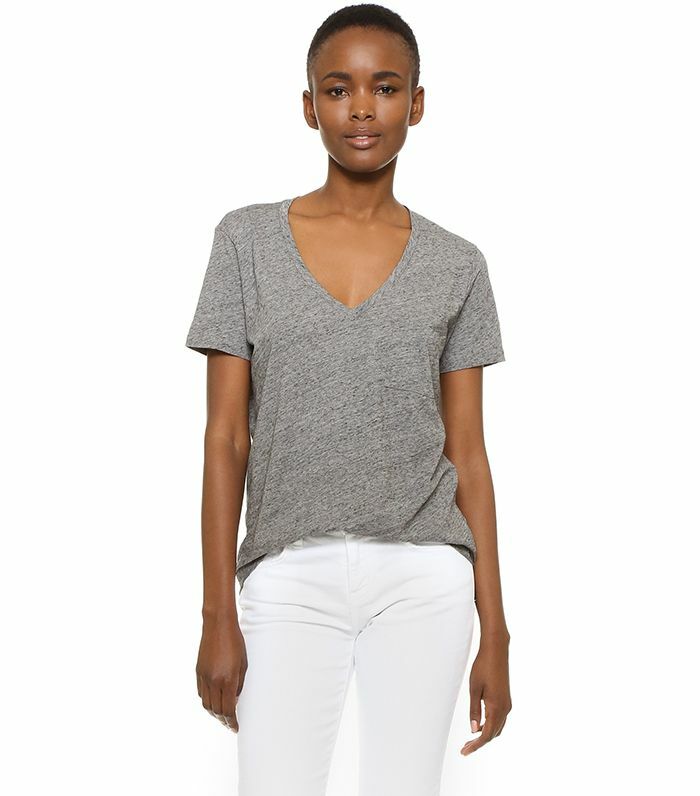 This boxy fit tee looks so chic paired with white jeans. A minimalistic choice that goes with everything. A relaxed, rounded hem brings a summery silhouette to this top. We're won over by this tee's sunflower-yellow color. We love this shirt styled with cuffed sleeves. Up next: the throwback '90s top that's fit for summer.